Diabetic nephropathy (DN) is the leading cause of end – stage renal disease (ESRD) worldwide. The pathogenesis of this condition is not well understood clearly at present. The relationship between angiotensin- converting enzyme (ACE) insertion/ deletion (I/D) gene polymorphism and risk of DN is still conflicting. 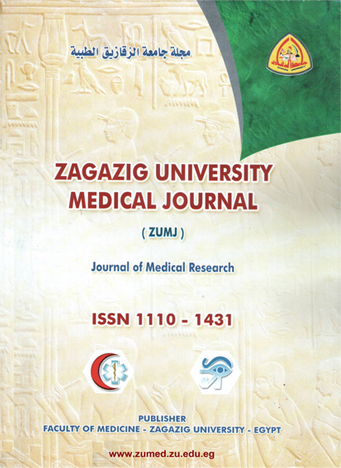 Therefore, we designed this study to investigate the association of ACE I/D gene polymorphism and development of diabetic nephropathy in a cohort of Egyptian population from Sharkia Governorate. Ninety patients with type 2 diabetes mellitus were included in the study. The first group included 45 without nephropathy while the second group included 45 with nephropathy. Both groups were subjected to full history taking, physical examination, routine laboratory investigations including fasting and 2 hours post prandial blood glucose, glycosylated hemoglobin, urine albumin excretion and urinary creatinine estimation. ACE I /D genotyping was carried out by polymerase chain reaction (PCR) amplification using allele specific primers. The frequencies of ACE DD, ID and II genotypes in group I were 11.1%, 55.6%, 33.3%. But in group II were 33.3%, 46.7%, 20% respectively. DD genotype was significantly more frequent in group II than group I (33.3% VI 11.1%), odd ratio1.5; 95%, Confidence interval (1.049-2.145), p<0.01). The ACE DD genotype is associated with diabetic nephropathy in Sharkia governorate.